While visually quite similar to his character in the pervious series, this Yuji is changed quite a bit in terms of plot. 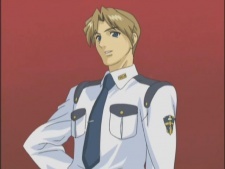 While the previous Yuji was a low-level perverted policemen, this Yuji holds the rank of Head Chief, and is portrayed as a smart, well educated officer from a wealthy family. Also, rather than just a perverted camera otaku, Yuji in Scramble is shown as a fairly successful lady's man. He still does serve as comic relief, since Rio still rejects his advances, causing him to be beat up by her a lot. But no matter how much Rio rejects him, he is still actively pursuing her.